Economic analyses of climate change policies frequently focus on reductions of energy-related carbon dioxide emissions via market-based, economy-wide policies. The current course of environment and energy policy debate in the United States, however, suggests an alternative outcome: sectorbased and/or inefficiently designed policies. This paper uses a collection of specialized, sector-based models in conjunction with a computable general equilibrium model of the economy to examine and compare these policies at an aggregate level. We examine the relative cost of different policies designed to achieve the same quantity of emission reductions. We find that excluding a limited number of sectors from an economy-wide policy does not significantly raise costs. Focusing policy solely on the electricity and transportation sectors doubles costs, however, and using non-market policies can raise cost by a factor of ten. These results are driven in part by, and are sensitive to, our modeling of pre-existing tax distortions. 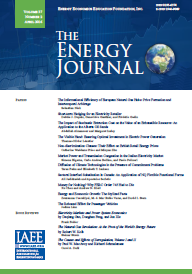 Published in Volume 27, Number 3 of The Quarterly Journal of the IAEE's Energy Economics Education Foundation.